Loop the loop is a series of events giving you the chance to explore your local library through film, installation, music and performance. 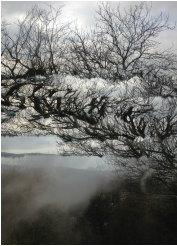 This is a project between artist/filmmaker JoannaMayes and Cornwall Libraries, working with a number of South West artists and the Bodmin community, including Bodmin College. At Bodmin, the event is inspired by the railways and travelling in Cornwall, especially the Bodmin and Wenford Railway. Artist/filmmaker Joanna Mayes has been researching local heritage sites as part of Loop the Loop. In Bodmin, Joanna has focused on the development of local trains, especially the Bodmin and Wenford Railway. Using standard 8 and 16mm film taken on Bolex cameras, Joanna will be hand processing footage at the library using instant coffee, washing soda, vitamin C and salt (Caffenol). Throughout the event, Joanna will also share a selection of 78rpm records on a wind-up gramophone, as inspiration for her film’s soundtrack. If you are interested in eco-processing of moving image or stills, or getting a glimpse into the world of the contemporary artist/filmmaker come in and chat to Joanna about her work. There will also be recipe sheets and tips on how to turn your kitchen into an eco-processing centre with no nasty chemicals. Mayescreative.com in association with Cinestar.org.uk and the Bodmin & Wenford Railway. Join Jo in the creation of a shared drawing on the project theme of trains. Try out some of Jo’s experimental drawing techniques, and help to complete a giant shared drawing for the library. No experience required. Creative animation artist Lizzie Black will help you create an animation, inspired by our project themes. You will contribute to a collage of visual imagery, which will be included as part of Lizzie’s Loop the Loop animation project. Drop in and share your stories and memories, over a teacake, of the railways or travelling in Cornwall. Lizzie will make a visual documentation that will contribute to her Loop the Loop animation project. Learn how to create a storyboard or a character together. All materials provided. No unaccompanied children please. Come along and enjoy a showing of the unedited film of the work made so far by artists and participants at Bodmin library. Members of local choir Canoryon Lowen, led by Nick Hart, will be joining us throughout Saturday morning, informally sharing some of the music they are working on at the moment. 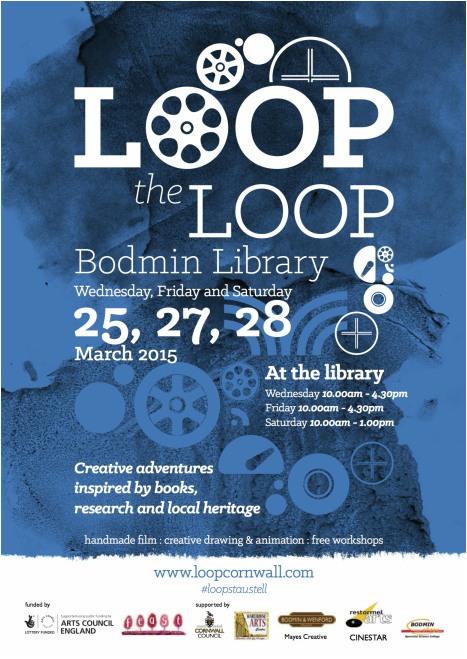 Loop the loop is a series of events inspired by books, research and local heritage. If you email our bookings contact, information in your email will be shared with Cornwall Council. Loop Cornwall will only use the information you provide to make bookings or answer enquires about Loop the Loop and will not use it for any other purpose without your specific consent. We will never pass your details to any other third party.